For those of you that are interested, I'm doing this challenge thanks to Luvvie. For those of you who, like me, find writing therapuetic and a way to avoid setting things on fire, it's a great idea. Arson is bad, or at least it is if you get caught. Today a new outlet mall opened north of the city (every time I say "the city" it feels weird... dang suburbs). The mall hyped itself up nicely, they're comping the tolls for everyone that gets off at that exit and the mall's grand opening made it to all of the local news shows. Slow news day? Maybe. What makes this mall "special" is that it also has some upscale stores along with the usual suspects like Wilsons. Apparently, a Gucci outlet is the best thing that's happened in the history of man. In fact, it is probably blasphemous that I'm not twitching with excitement at the mere thought of it. Patrons stood in line for an hour to go into the Gucci store. Standing in line, for an HOUR to get into a store is dumb in and of itself. But this?!? Standing in line for an hour to spend triple what you should be for an article of clothing is a poor life decision. I don't get it. Do. Not. Get. I know we're not supposed to judge people by their appearance. I know and I'm sorry, a little. But if you're in the mall, looking like "why" and "what for", your primary concern shouldn't be the Gucci outfit. People put so much emphasis on designer labels, and for what? 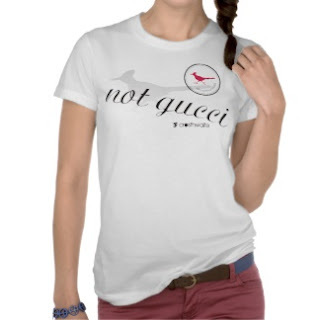 Wearing a Gucci t shirt isn't going to enhance your life. That new outfit isn't going to get on the corner and make some money if you come up short. Also - if you're so thirsty for Gucci you can justify standing in line for an hour to get an "outlet" version. You're not Gucci, not Gucci at all. I don't get it. I know some people are very label conscious, I just can't wrap my head around it. A pet peeve and complete irritant. You don't have $37 to your name but you have a $370 purse on your arm? Your kids have to duck down at night because of shooting but you're paying a $400 car note? You're working overtime to make rich folks richer? ?